Nikon MONARCH 7 riflescopes feature one-piece 30mm main body tubes and a glass etched BDC reticle, plus the Custom XR Turret package – so you have the option to either dial-in your distance on the crosshair, or to utilize the holdover points on the BDC reticle. The MONARCH 7 riflescope series features the Custom XR Turret package, which allows you to custom match the distances inscribed on the elevation dial to the specific ballistics of your load and environmental conditions. As a result, you can dial-in your exact shooting range and hold your crosshair directly on your target for every shot. Redemption voucher for your Custom package comes with each riflescope. You can also order additional turrets to match additional loads, velocities or extreme environmental factors. 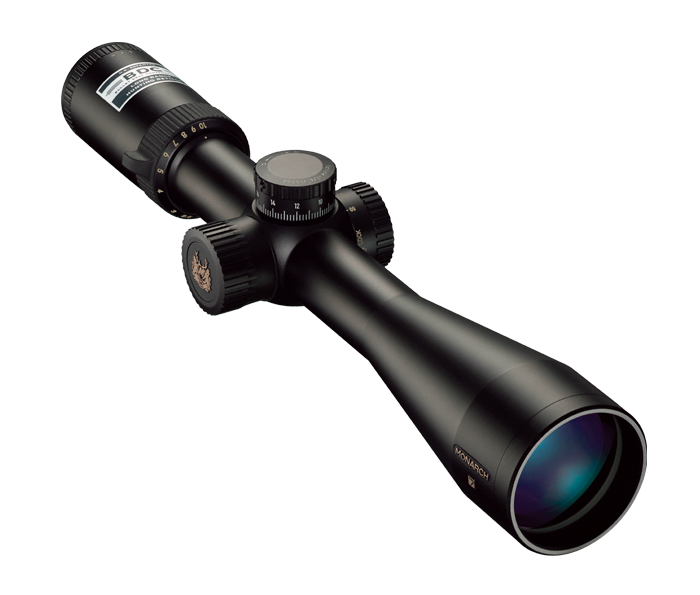 Nikon has engineered the entire optical system to provide the shooter with a bright, sharp and incredibly flat sight picture and light transmission up to its theoretical maximum- 95% for clear sight picture from dawn to dusk. Like all of Nikon’s riflescopes, the MONARCH 7 series is optimized for use with Nikon Spot On Ballistic Match Technology. Spot On allows you to discover all of the exact aiming points on your scope’s reticle at various yardages for your specific ammunition and load.